Recover the skull of a legendary bear. Talk to Curator Umutha at the House of Orsimer Glories once you've become Hero of Wrothgar. Enter Coldwind's Den and find the bear's tomb. Place the four items on the correct pedestals, based on the related cardinal directions. Take Coldwind's Skull and return to the museum for your reward. To obtain this quest, you must first earn the Hero of Wrothgar achievement. This requires completing 40 quests in Wrothgar (including Long Live the King, the final part of the main quest), clearing all six delves, and defeating the majority of the zone's Group Bosses and the bosses found in Old Orsinium and Rkindaleft. You also need to collect sixteen relics for the House of Orsimer Glories. The optional relic from the quest Sorrow's Kiss is not included in this total. With all of these prerequisites met, Curator Umutha will task you with recovering Coldwind's Skull, the final relic on her list. 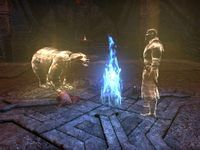 According to prophecy, the skull will reappear during the hour of Wrothgar's greatest need to herald the return of Coldwind, a giant bear tamed by King Torug before the founding of Old Orsinium. Believing you to be the great hero of prophecy, Umutha will direct you towards Coldwind's Den. Coldwind's Den has no map marker, and can be found at the foot of Sorrow, along the coast. The easiest way to reach it is to head east from Jehanna Docks. 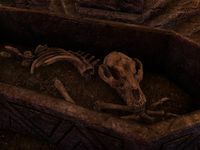 However, the cave is filled with the servants of Malacath; Dremora, Frost Atronachs and Ogrim can be found throughout. The ground is also littered with ice runes, which will explode and summon a Dremora enemy if you step on them. The tomb can be found at the end of the dungeon. Inside, the spirit of King Torug will berate you for disturbing Coldwind's rest, and will explain the ritual to summon her. Four items are placed throughout the tomb: Blood of the North, Meat from the West, Water of the East and Fire from the South. You will need to arrange these around the central platform so that they correspond to the related cardinal directions. Once this is done, Coldwind's spirit will appear to re-enact Torug's taming of the beast. You will then be free to take the skull from the nearby coffin. Return it to Umutha to complete the museum's collection and receive your reward: a pack of three bearskin costumes (Cavalier of the Sworn Oath, Old Orsinium Sentry, and Trinimac's Penitent Knight).